It's all about a day in the life of a Cheek with a little of this and a little of that added too. Jonah Buddy is 6 months old. Where did the time go? Really....where did it go? Today he figured out how to crawl. He's already into everything, but thankfully he's pretty slow still. Yes, that's right Jonah....I caught you. Jonah is also eating real food now. He's eaten avocado, bananas, sweet potatoes, and peas. All of which were pureed with love by his momma. He likes everything with a little fresh ground pepper. I walk around his chair with my pepper mill and ask, "would you like fresh ground pepper on that sir?" He loves being outside. (Good thing since we're outside so much for baseball games these days.) He went swimming the other day for the first time and loved it. Splashing water is fun! I feel like the next 6 months will fly by. Before I know it we'll be celebrating his first birthday. How will I handle this little one growing so fast? For every decent picture I take there's about 5 before and 5 after that aren't so great. I do however have some rules that I try to follow so I don't pull my hair out, get frustrated, scream at the kids, and give up during a photo shoot. When I follow these rules I'm not as disappointed when going through the pictures later on my computer. 1) Prepare everyone ahead of time with what you want to accomplish. 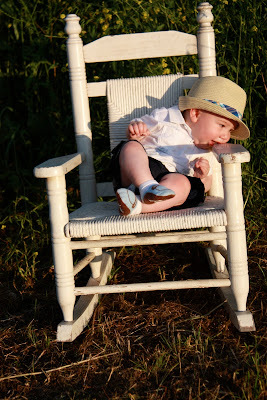 In this case I told the kids before we were standing in a chigger infested field sweating that we'd be taking some pictures standing, some pictures in the chair (and yes, we'd take turns getting to sit in the chair). Sometimes Carter would hold Jonah and sometimes Evan would hold Jonah. If they know what's going to happen ahead of time it's easier to move from one pose to the next. 2) Shoot in digital! It takes so much of the pressure off. You can snap a million photos and hope there's a good one in there somewhere. This series is a perfect example. Evan is a stone cold poser! He looks directly at the camera, smiles, doesn't blink and even attempts to comfort Jonah all while looking right into the lens. 3) Listen to their ideas. Rather than fighting with Evan about holding the bluebonnet in the picture (which I started to do), let them have their way for a few pictures. What does it hurt? He's excited that we used his idea and even though I'm not going to hang these on the wall, I still enjoy them and they make me laugh a little. Trust me...a strong-willed child needs to be heard, accepted, and validated often. This was an easy way to do that without a huge fight. 4) When it's sunny use the "1...2...3...open" approach. They're not going to be able to stare into the sun while you set up your shot. To avoid as many squinty eye and closed eye shots explain to the kids that they can keep their eyes shut until you count to three and say open. Practice inside for a while so they understand what it feels like and how to open their eyes and not look crazed. You might still get a picture like this though. 5) Make sure you're the only one with a camera at the photo shoot. It's frustrating to upload your pictures when you get home thinking have a decent picture of all three boys but one is actually looking at someone else's camera. Only have one person giving direction too. When there's too many leaders and too many cameras the kids get confused and frustrated. You will not get good pictures if they are frustrated. You have to keep the models happy! 6) Don't let the models eat...not even the props. 7) Most of us mommies aren't professional photographers so lighting may not be perfect and your composition may be off a little. The easiest way to improve your pictures is to eliminate distractions. Don't let them wear distracting clothing. Solid color shirts are best. Jonah's socks were really cute that day, but the label on the bottom was distracting. Pay attention to those things and remove them from the picture. Also look for things like houses, people, or telephone lines that might end up in the background of your photo. Your kid may look cute but if there's an old junker car in the top corner of the picture you won't be able to use that for a greeting card. Try your best to pay attention to these things. Sometimes they can't be cropped out. 8) Don't be too hard on yourself. Accept that you're doing your best and capturing memories that you otherwise wouldn't have if you didn't try. We finally has some rain here in Central Texas. A lot of rain! With a lot of rain comes a lot of flowers. Bluebonnets are the state flower here and if you live in Central Texas you take pictures of your kids in bluebonnet patches. It's just something you have to do. You dress them up, you take them into a field, you get chiggers, you sweat, and you say things like, "look here...smile please...just a few more...come on guys...". It's great fun. Here are the best pictures from that day. Carter wanted one of himself laying down in the bluebonnets. Evan is such a ham. It's hard to believe I got one of him looking so serious. Always happy and always there to brighten your day. Blogging has become increasingly more difficult over the past few weeks and even months. We no longer have a cleaning lady, so my mornings are spent cleaning up the house. Before my mornings were spent reading blogs, writing blog posts, and drinking a cup of coffee. Jonah is on the move now. Well....he's working his hardest to be on the move. He doesn't crawl yet, but that could change later today. He's almost there. Baseball has taken over our lives. Both boys play and Shawn helps coach Evan's team. I love going to watch them all dressed up in their uniforms. Jonah enjoys the great outdoors and is usually happy being pushed around in his stroller. After basketball he's used to hearing me yell for the boys. Big things are happening to the Cheek house too. We're in the very beginning phases of adding on some extra space to our house. We've been meeting with builders, looking at land, and doing our very best to make the right decision. We decided to stay in our house and add some fun extras. As things get moving I'll keep you posted with updates and pictures. Until the next time I can sit at the computer I want you all to know....I think of you often and I'm so grateful for each person in my life. The boys have been wanting to go camping for quite some time but the problem is, their parents aren't much the camping type. Good thing their Gramps is! Time is not usually on our side when it comes to our schedule because of church, baseball, the studio...etc so camping far away was really out of the question. An easy solution for that problem is camp in Gramps' back yard. First they built a fire pit. Then they built a fire. They cooked hotdogs and beans over the open fire. They told stories around the camp fire. Shawn, Jonah, and I left after eating and playing a little guitar around the fire. What I don't have pictures of is what happened at 3:00am. The wind picked up, the rain started, the thunder clapped, and lightning lit up the sky. Carter woke up and said, "Gramps it's raining." Evan slept through it all had to be woken up right before they decided to make a run for the house. There's something about my dad and camping that always seems to bring the rain. The kids thought the trip was successful. I thought it was successful because they slept all day Sunday. Over the break both boys finally had the determination to learn to ride their bikes. Carter learned first and that lit a fire under Evan. A few days after Carter learned, Evan learned. This is a video from his first independent ride down the street. Carter and Shawn rode their bikes to the Donut Shop for coffee, orange juice, and donuts one morning. The next morning Carter and I rode our bikes to Rocket Cafe for pancakes. At breakfast Carter said he feels just like Henry Huggins when he rides his bike to "town". Evan likes to cut through the fields behind out neighborhood and ride all around the high school, intermediate, and junior high. He picks up rocks, tennis balls, and other various "finds". He informed me he needs a backpack for all his treasures. Boys and bikes....it's a beautiful thing! My Family IS a Circus! I've been a busy mommy lately! Both boys had baseball tryouts. Both boys have had two practices. We've had three interviews at the studio. We've started a new Shawn Cheek School of Music blog. I got a sunburn hanging out by the pool. Shawn taught two of our small group meetings at church. I showed up. Jonah is trying his hardest to crawl. I'm try my hardest not to cry at how big he's getting. I've run close to 20 miles. I've done about 1000 sit-ups. I was trained to manage the Relay For Life of Waco's website. I managed to fall asleep during three movies...J. Edgar Hoover, Tower Heist, and In Time. I've driven down the main highway in Robinson dozens upon dozens of times. Just writing this post is making me tired and I still have laundry to do. Shawn's about to drink a pot of coffee and tomorrow will be here before I know it. Each day is full of a long list of things to do and places to go. You'd think I need a break, but this life is wonderful and I wouldn't want it any other way. Number one priority for tomorrow is go to the grocery store. I offered Carter pickles for dinner (it's one of the few things left in the fridge) but he refused. We had to stop by Subway after his baseball practice and we picnicked on the grass while watching Evan practice. I stayed awake at 6:00am after feeding Jonah, made the kids a much healthier lunch than they'll get in the lunch room, and went to breakfast with Shawn. I gathered up clothes that don't fit the boys and took them to Goodwill. I went to the gym, shipped a package of Shawn Cheek Bootcamp Sight Reading DVDs, and....wait for it....I washed my hair! Maybe I AM Wonder Woman. After eating too much breakfast After an invigorating workout, I thought it would be a great idea to replace my ham sandwich with a healthy smoothie. Blend until smooth. I don't have the most expensive blender on the market so I had to help the smoothie along by pushing the ingredients around while blending to get things going. Just don't get your spoon caught in the blades! The flaxseed has no flavor that I can tell. It doesn't quite blend up, and can be a bit crunchy in your smoothie. Shawn thought they were strawberry seeds so it obviously wasn't too big of a deal, and it's a natural way to add a lot more fiber to your diet. This recipe makes two servings, each about 300 calories. Next time I'll try it with one less banana and more spinach. I'm going to see just how far I can push it before someone asks why I put spinach in their drink.